Oh, what a tasty twist on that plain old chicken finger. You can use a similar method to make those tasty coconut shrimp as well. Sure you could serve these with a plain old plum sauce but my favourite is to get a nice thai style sweet and spicy sauce. Oh my delicious! It doesn’t take much sauce to bring you to flavourtown. Which is what these fingers are all about really. Yum! Cut the chicken breasts into strips. I usually get about 3 or 4 strips per breast. If the chicken is particularly plump you may need to pound it a bit to get some nice thin strips. Combine the coconut and panko bread crumbs in a medium bowl. Dip the strips in the egg white. Coat the strips with the bread crumb mixture in the medium bowl. Bake the coated strips for 15-20 minutes at 400F. For extra crispy fingers give them a spray of butter flavoured cooking spray. Makes 2 servings. Each serving contains 185 calories, 4.4 grams of fat and 1 gram of fibre. Don’t forget, that thai sauce is really the way to go for these. Another tasty dipping sauce for these fingers is my Spicy Peanut Sauce. 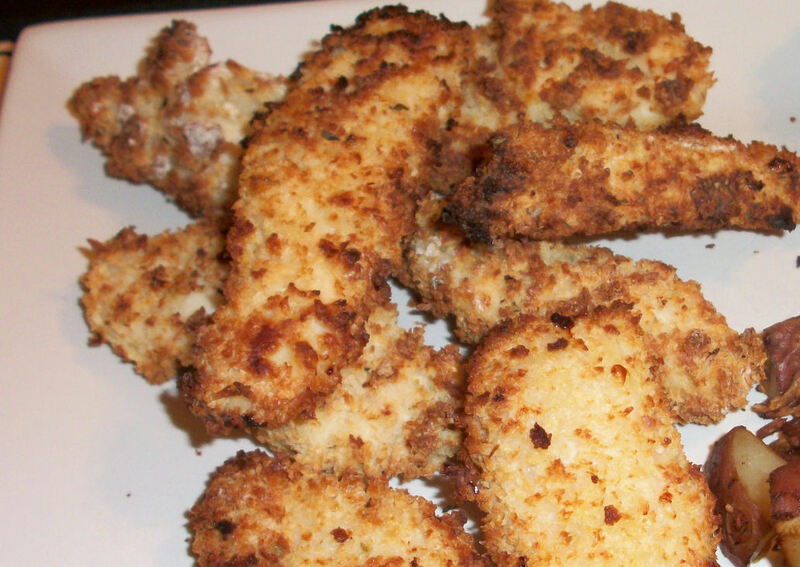 This entry was posted in Comfort Foods, Craving Buster, Dinner and tagged Chicken, coconut. Bookmark the permalink.